Does the fool have a place in society today and who is he? In the performance FOOL we meet the modern fool who has devoted his whole life to this role and to his modern “fool technique”. His methods lead him into great moral dilemmas, and radical choices must be made. Choices that ends up pushing him over the edge “I have studied people. I know what they will do before they do it. That’s why I have an advantage. 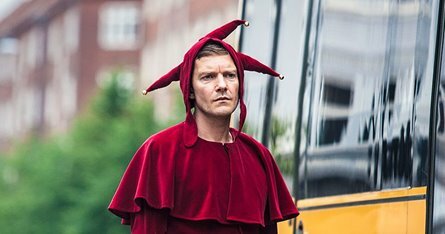 I’m always one step ahead.” FOOL is a devised performance created in close collaboration between director Erik Pold and actor Johannes Lilleøre. Taking inspiration from Donald Trump among others, it has become a story about the little man you fear a bit.